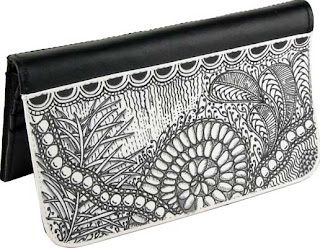 Life at Stamping Details: Zentangle Faux Leather Wallet Class with Suzanne! This faux leather wallet with a white polyester flap provides a great canvas to explore creating your Zentangle art on fabric. The class fee includes the wallet and a black pen for fabric. Students should have a basic understanding of the Zentangle process and a repertoire of tangle patterns to use. Please bring: Gray pen for shading (Tombow N79 or N95 and Fabrico Dual Tip Fabric Marker - Light Gray work well). Colored gel pens if you wish to work in color.